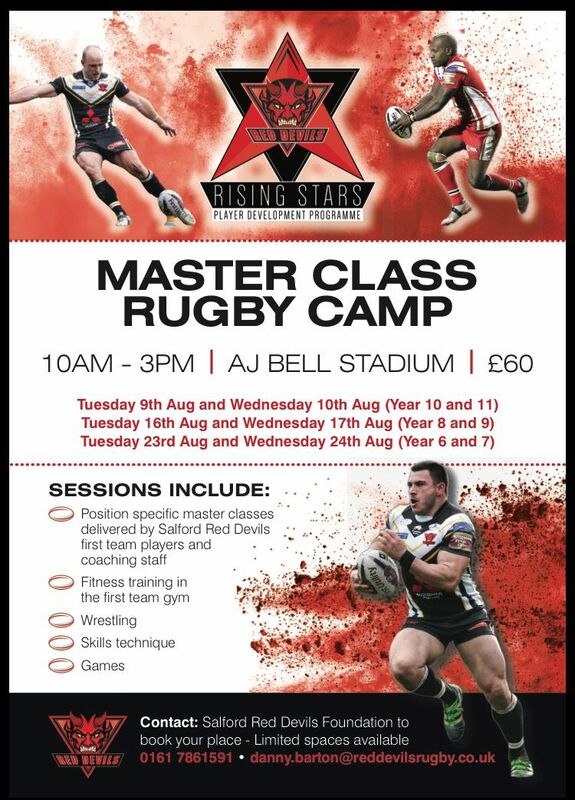 The Salford Red Devils first team stars and getting ready to welcome young aspiring players to the AJ Bell Stadium for a series of masterclass camps. The camps, run by the Salford Red Devils Foundation, will give players from local community clubs the opportunity to learn from the best as the professionals provide position specific coaching, passing on their experience to the next generation. The camps are open to boys from year 6 to year 11, starting with the year 10 and 11 camp which begins on the 9th of August. Day one of the camps will be opened with a movement and agility training session with academy Strength and Conditioning coach Mike Thomasson, who will give participants a glimpse of routines followed by the games top players. Following this, they will go into a wrestling technique session taken by Red Devils Prop Craig Kopczak, and Loose Forward Mark ‘Flash’ Flanagan. This session will show the participants who to become a dominant force in the tackle and control rucks. After dinner, the group will split into forwards and backs for a field training session. The Backs will be overseen by half-back and fans favourite Rob Lui. The participants will be taken through the essentials of good Backs play through a series of drills taken straight from first team training. The Forwards will be taken into a session with the Reds hard hitters such asGeorge Griffin and Olsi Krasniqi who will take them through a Forwards skills session and give them pointers on how to be an effective forward in the modern game. On day two of the camp, following a behind scenes tour of the AJ Bell Stadium, the group will again be split into their positions, to build on the things they had been taught on the first day. The Forwards will be able to benefit from the vast experience of Weller Hauraki who has played in both Super League and the NRL. The Backs will be taken into a session with the likes of Winger Justin Carney and Full Back Gareth O’Brien, who will go through the basics of good attacking play. The camps can be booked through e-mailing danny.barton@reddevilsrugby.co.uk and are priced at £60. All player appearances are subject to change due to injury, playing and training commitments.